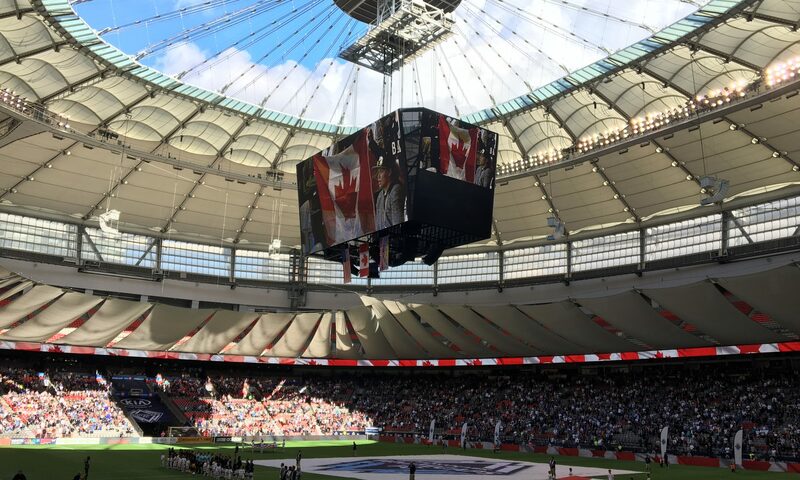 As Vancouver prepares to welcome the world to BC Place for the 2019 HSBC Canada Sevens tournament, Rugby Canada announced that World Rugby has awarded Canada Seven 4 more years, taking the tournament to 2023. During the announcement at the Celebration of Rugby at šx??? ?n?q Xwtl’e7énk Square (Vancouver Art Gallery North Plaza) dozens of Rookie Rugby kids were mentored by Rugby Canada players, John Moonlight, Ghislaine Landry, Justin Douglas and others. Representing the grassroots growth and recognition in the sport Canada Sevens has brought to rugby in BC and across Canada, these youngsters will get to grow up with a world class event in their backyard. In its’ first three years, HSBC Canada Sevens has raised the bar for rugby in Canada, sparking greater awareness and growth while generating more than $60million in economic activity. The city hosts teams from 16 competing nations, including Canada, in addition to fans from near and far, booking more than 2,300 hotel room nights. Teams spend five days in Vancouver prior to the tournament, and visiting schools, community centres or First Nations during their stay to further promote the sport of rugby in the community. The 2019 HSBC Canada Sevens hits the pitch at BC Place, Saturday March 9th and March 10th, 2019. Limited general admission tickets are still available, book a ticket, grab a costume and cheer on your favourite team! If you can’t make it to BC Place this weekend, head across the water to take in the HSBC Canada Women’s Sevens at Westhills Stadium in Langford, BC (outside Victoria) May 11 – 12, 2019. This past weekend, Ballet BC Program 2 wrapped up at Queen Elizabeth Theatre. As Artistic Director Emily Molnar and Executive Director John Clark welcomed the audience, the dancers prepared to perform three diverse works. 1st Flash opened the program. Choreographed by Jorma Elo, 1st Flash premiered in 2003 with Ballet BC presenting the Canadian premier in 2011. Six dancers displaying beautiful harmony, and grace, while dancing in silence, as well as to Jean Sibelius’ Violin Concerto in D Minor. Which/One choreographed by emerging artist Adi Salant, commissioned by Ballet BC made its world premiere. Combining modern and classic movement and music, sixteen dancers, filled the stage with a lively, contemporary work. Incorporating music and dialogue from A Chorus Line, I Hope I Get It, felt suitable for a piece that included a number of Ballet BC’s emerging dancers. Solo Echo is another returning work, first premiered by Ballet BC in 2015. Choreographed by Crystal Pite, Solo Echo finds seven dancers moving with strength and agility to beautiful music of Brahms’ Cello Sonatas in E Minor and F Major. Can you believe it’s already the end of January! Those of us in the West are already seeing blossoms, early but just in time for the Spring Festival events included in this week’s picks. Yoga: Don’t miss your chance to take part in the last free Wednesday yoga class at Gateway Theatre before the opening of their upcoming Yoga Play. Rock: Prepare for grease-paint, leather and fireworks as the Kiss : End of the Road tour comes to Rogers Arena on Thursday evening. Broth: It’s your last days to visit participating restaurants in the 1st Vancouver Foodster Soup Festival to taste and vote for your favourite soup. Wander: The Winter Wander at Vanier Park returns on Saturday, February 2nd, a family fun event with $5 admission opening the doors to Museum of Vancouver, H.R. MacMillan Space Centre, Vancouver Maritime Museum, City of Vancouver Archives, and Vancouver Academy of Music with performances by Bard on the Beach and Vancouver Academy of Music, plus food trucks, prize and other fun all day.